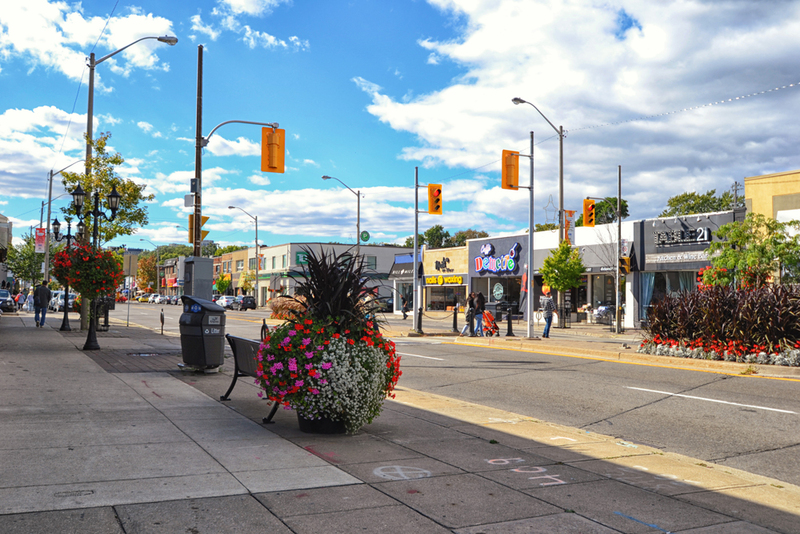 The Kingsway is one of the most affluent areas in Toronto, along with the Bridle Path and Forest Hill. In the early 1900s, lawyer Robert Home Smith acquired a large section of clergy land and developed it to meet his detailed vision of a Canadian English manor house landscape. That vision holds true today, with wide, winding streets showcasing stately homes built in a Tudor English style, along with some Edwardian and Victorian. If you buy a home in the Kingsway, you’ll enjoy a lifestyle that’s tasteful and quiet, graceful and luxurious. The Kingsway Bloor or Kingsway Village features shops and restaurants within walking distance. The local Starbucks is always full, and you can see neighbours greeting each other as their dogs drink from the water bowl outside. The LCBO features one of the best Vintages sections, catering to the area. Not to mention the abundant trails and walking paths along the Humber River, year-round events, recreation opportunities – even a day spa that offers a night at the luxury hotel and a grand formal dinner. The Kingsway real estate market usually moves fast. Turnover is not overly high in the area, and most homes are only on the market a few weeks. A home in The Kingsway tends to command high prices, even if it has not been renovated for decades. Reminiscent of a time gone by, the neighbourhood has managed to maintain its original stately feel, with many homes still retaining the elegantly opulent interior features as first installed by Robert Home Smith, including sandstone from the local area Humber and Credit River quarries, wrought iron railings, bay windows, and oriel windows. Even when these iconic houses are updated to add modern conveniences, their historic character is preserved. In addition, there are spacious, luxury low- and mid-rise condos around the Old Mill and on Bloor Street, which many residents downsize into. However, availability can be an issue. For example, there is one luxury rental building that usually has a two- to three-year waiting list. The Kingsway is bordered to the south by Bloor Street, to the east by the Humber River, to the north by Dundas Street West and to the west by the Mimico Creek. The area is also located 15-20 minutes to downtown by driving and 15 minutes to Toronto Pearson Airport by car. This, plus the close location to highways and many parents’ and kids’ groups, makes this area the ideal place for executives and their families. If you are interested in a home in The Kingsway, you are truly buying a lifestyle. Interested in a Home in The Kingsway? We have helped countless others find their perfect Toronto home. For more information about The Kingsway real estate, contact Rayissa at 416-400-0805 or complete our contact form.